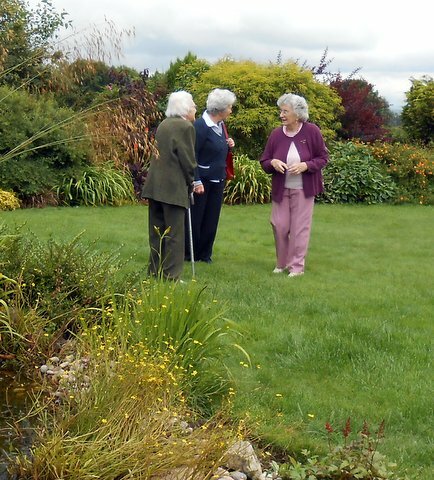 At the kind invitation of Beryl Mason, a stalwart member of St. Mary on the Rock, we spent the afternoon in her lovely house and in the garden on the outskirts of Ellon. 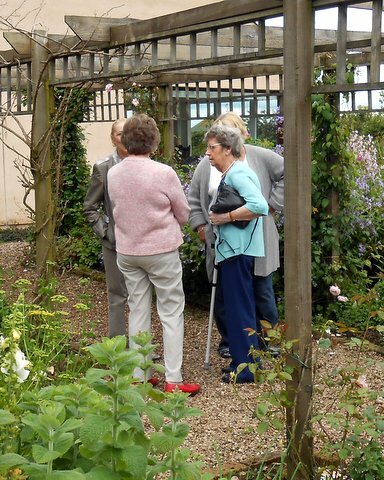 Despite the inclement weather, the flowers and flowering bushes were out in abundance and we had great pleasure in spending time to look round this wonderful display. 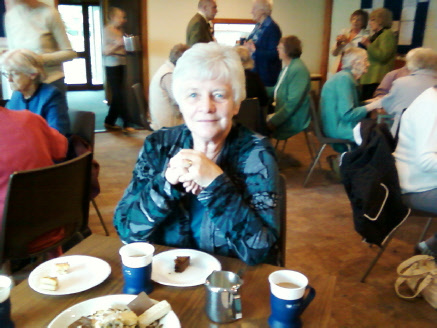 After a prayer and our notices by Carole Fox, we all enjoyed the tea and cakes. Beryl is a wonderful hostess and, as usual, the cakes and tarts were a joy to behold and eat. 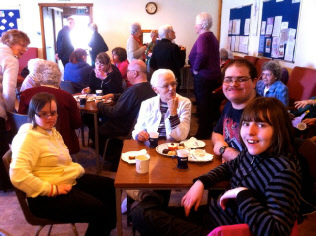 It gave us great pleasure to entertain, once again, the residents of Ellon Sheltered Housing at our July 2012 meeting. Our Leader, Carole Fox, took the service and the organist was Alison Stephen, Alison (below) was also celebrating her birthday and wedding anniversary and was presented with a bouquet of flowers. 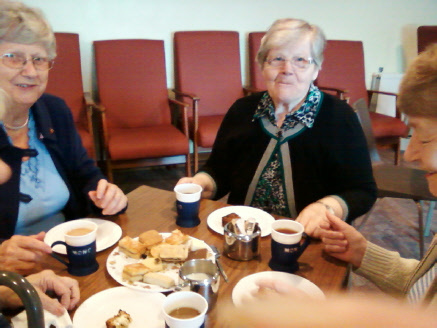 After some rousing hymns, followed by prayers, we went for tea and cakes in the Church Hall (below). 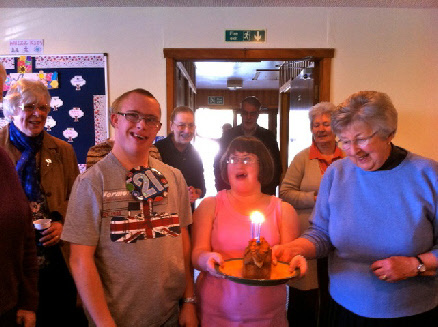 Everyone said how they had enjoyed their afternoon and again congratulated Alison. Our meeting for June 2012 was to be an ‘Evening of Archaeology of Old Aberdeen and other Tales’ given by Judith Stones, the Lead Curator of Aberdeen City Museum Department. Judith displayed pictures of a Corinthian helmet, plus a medieval buried hoard of silver coins which had been excavated in the city, together with leather goods, including shoes, a wood and daub panel and wood all in a good condition. 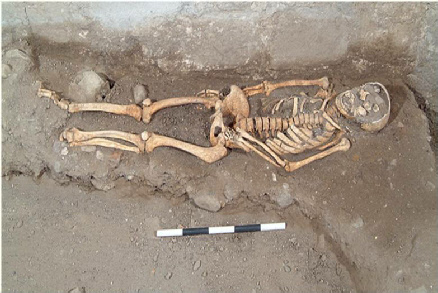 At St. Fergus, Dyce a 13th century grinding stone, 14th century eggs shells and the remains of a Carmelite Monastery built around 800 AD were discovered and safely excavated. Judith has many different job descriptions that come under her jurisdiction, among them - ‘Art from Aberdeen’ to America, China, etc., overseeing planning applications where buildings may be built on ancient sites, guided walks, and digging on sites of interest in Aberdeen and Aberdeenshire. Everyone wanted to hear more in due course as there was so much to learn about the subject and all promised to keep their eyes open for the ‘Yellow Plaques’ around Aberdeen showing where people of note in Art, Science and Music lived. Doreen Bailey gave a vote of thanks showing our appreciation for an instructional and interesting evening. Once again it was our pleasure to welcome the Ellon Resource Centre to our April Meeting. The Revd. Cannon Peter Mander led the short service, with Margaret Murray and Doreen Bailey saying prayers. The hymns, as usual, were well received and with everyone in good voice. - he was very surprised, but pleasantly so. 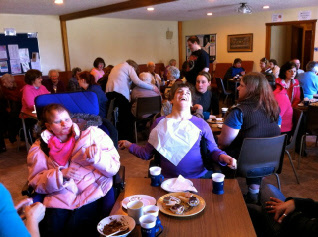 Photos of the guests enjoying tea. This was our theme for our meeting on 3rd April. The speaker was Marie Mander who gave a talk on the Jewish Passover. We all sat at tables on which was a cup, small glasses of wine, some eggs and a napkin. A slideshow then explained how the table was laid for the meal and the Marie lit the candles. A reading on the making of unleavened bread followed, after which we raised our glasses and said “thank you Jesus” and took a small drink. This was followed by the ‘Ritual Cleansing’ where we passed round a cup of Holy Water and blessed each other on the forehead saying, “may you be cleansed of all evil in Jesus’ name” and then “Amen”. We then had the breaking of the bread which we found under the napkin and, after a short silence, we ate the bread. Lynda George then opened a door and let in a poor lonely person and we all said, “WELCOME” . We raised our glass to ‘Christian Freedom’ and drank a small toast. We were told about the wooden cross and what it stood for, it being for the sacrifice of Jesus and for a spotless lamb that was sacrificed. Instead of a charred bone the rugged cross was displayed as a centre piece. Eggs are a sign of new life and make a perfect symbol for the Passover and over Easter. We ate our egg (a very small one) and then had a reading from Exodus 12, verses 1-18 and 14. After a short silence we had a small toast to say “thanks be to God”. This gave us a lot to think about and reflect on, and it made us realise how much work and thought had gone into this talk on the meal for the Passover. Margaret Murray thanked Marie for a most enlightening talk on behalf of us all. Our meeting of 6th March 2012 was well attended by members and a number of friends as guests. Our speaker was Alan Cameron, a well known local man, who is a retired headmaster of Ellon Academy and a local councillor. His talk was about ‘Churches in Ellon and the surrounding districts’ and he gave us a potted history of Christianity coming to Northern Britain-Pict country or as we now know it, ‘Scotland’. 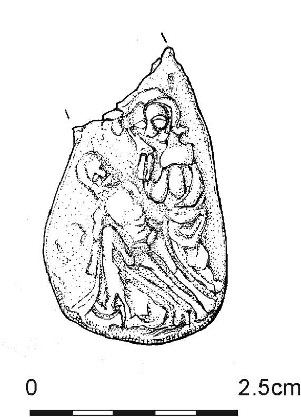 One of the earliest settlements in the Buchan area was the abbey at Old Deer, of which Ellon was an outpost. He then went on to tell us of the history of the original church of St. Mary on whose foundations the now parish church is built. The Reformation changed things in Scotland and with the coming of John Knox Presbyterianism was accepted as the religion here. At one time there were eight churches of different persuasions in Ellon, some of which still exist but have other uses (Fraser's Stores being an example). The top floor of a house in The Square was used as a Roman Catholic Chapel until they moved in the 1970's to a new church built in Union Street. When walking around Ellon in the future I am sure we all will look at the various buildings with new eyes. A vote of thanks was given by Sheila George. We began our New Year with an Epiphany Eucharist, which was very well attended. After the rush of Christmas and New Year it was good to have time to reflect on the times to come. Our February meeting, again well attended, was a talk and slide show on ‘Churches across America’. Charles Fox gave us a most interesting talk and some great pictures. We started by seeing St.Paul’s church in Woodbury, Connecticut, a typical wooden building with a most interesting altar and organ. Adjacent to the church was ‘Glebe House’ which after a meeting of various influential people, resulted in the election of the first Bishop, a Samuel Seabury. The Bishop later came to Aberdeen to be consecrated leading to a connection with Woodbury, which continues to this day. Charles continued his talk with a series of photographs of churches in the Colorado area, ranging from the Grace Cathedral (built from 1925 – 1964) to an Air Force Cadet Chapel and St. Mathew’s Church where Carol Fox had taken part of the church service. Our Secretary, Shiela Alborough gave Charles a vote of thanks and a small gift on our behalf for giving us such an enjoyable insight into their visit across America.